Free Shipping Included! 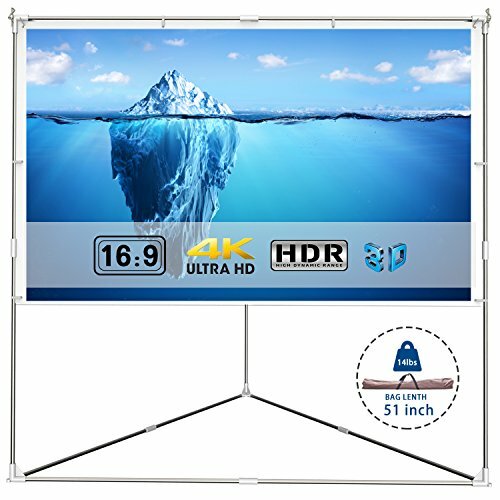 Projector Screen Stand Outdoor Portable – EleTab 100 inch 16:9 Movie Projection Screen Wrinkle-Free with Triangle Stand for Home Theater, Gaming, Office by EleTab at Home Entertainment Centers Online. MPN: ELTSP-01. Hurry! Limited time offer. Offer valid only while supplies last. 【Super large screen】16:9 screen format and diagonal 100", over the 160-degree viewing area, bringing you a fantastic widescreen experience. 【Premium material】The projector screen is made of PVC Matte White material with 1.1 Gain which gives a high color reproduction. Black background screen eliminates light penetration. 【Stable Triangle Base】The base is made of aluminum hole, and a triangle base on the bottom which could against the gentle breeze. 【Wide Application】Ideal choice for home theater movie, education, conference room presentation, public display, outdoor movie and more. 【Portable & Setup】Carry bags included for family trips, camping, etc. Easily stowed away in the car or sedan trunks. Setup takes less than 15 Minutes.